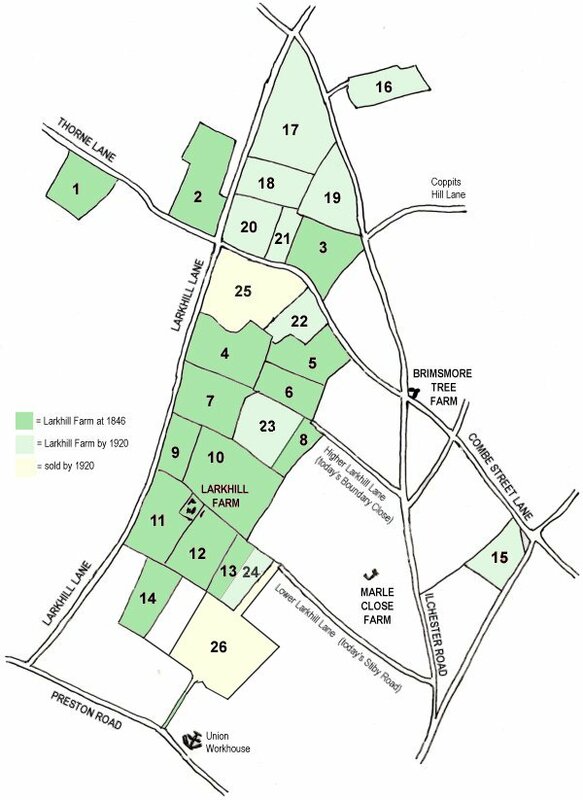 Larkhill Farm was primarily a dairy farm located to the east of Larkhill Lane (today's Larkhill Road) and either side of the field access track known as Lower Larkhill Lane that would eventually become Stiby Road. The farmhouse and farm buildings were located roughly where the new Perrythorne Park has been built. Of course, over the years various fields were sold off (for instance Dampier's Mead in 1899 - the only parcel to be sold in an attempt to sell off the whole farm) and new fields acquired. The darker green fields concentrated around the farmhouse and shown on the1920 map below are probably typical of the farm through much of its history. Once a large farm approaching 130 acres, its final demise was in 1920 by which time so much land had been sold off that only 22 acres remained. From various sales as reported in local newspapers, a dairy herd was kept as well as a substantial number of pigs, horses and chickens. Cider was made on the farm and, as well as being used as part-payment for farm workers, was also advertised for sale. 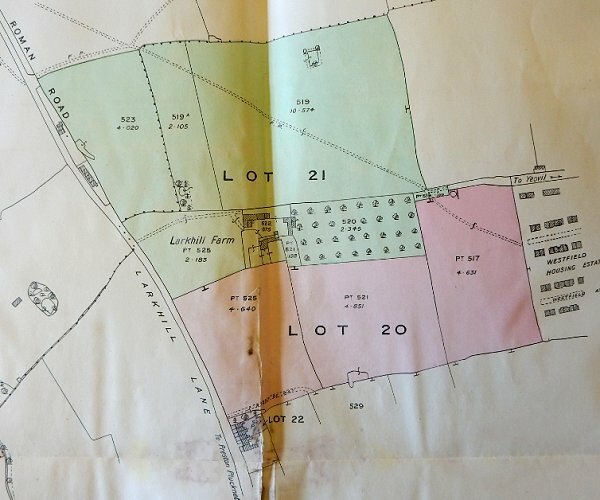 A Counterpart of Lease dated 25 March 1859 between Captain William J Prowse of Enham House, Southampton, Ret’d Capt RN and William Symes of Yeovil Marsh, Yeoman, tabulated the fields comprising Larkhill Farm in the Parishes of Yeovil and Preston at that time. In 1951 the Corporation earmarked Larkhill Farm for use as an emergency mortuary in case of nuclear war, etc. However the farmhouse was demolished by 1953 and the changing rooms at Mudford Road Playing Fields were earmarked in its stead. 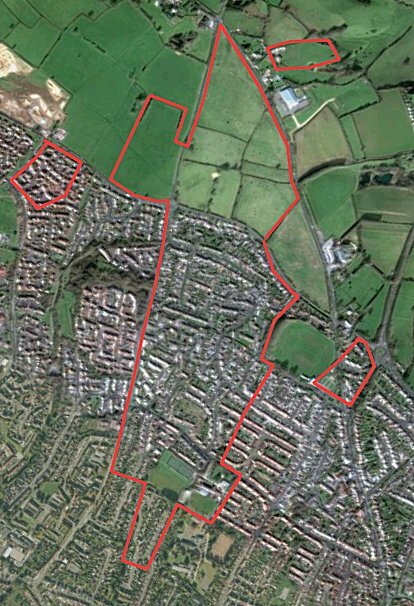 As will be seen from the modern aerial photograph with the outline of the farm superimposed, the land of the former Larkhill Farm is now completely covered with housing with the single exception of the green space around Westfield Academy. 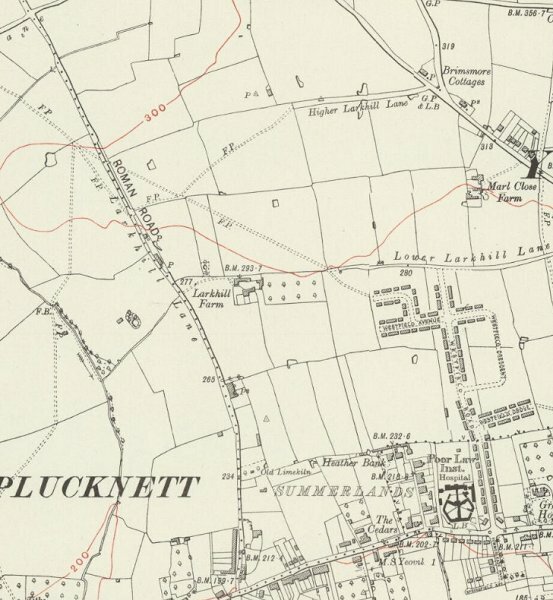 An extract from the 1928 Ordnance Survey showing the location of Larkhill Farm (at centre) relative to Larkhill Lane running from top left to bottom centre, Ilchester Road at top right and Preston Road at bottom right. Lower Larkhill Lane, seen at centre right, would be extended to join with Larkhill Road in the 1940s, becoming Stiby Road. 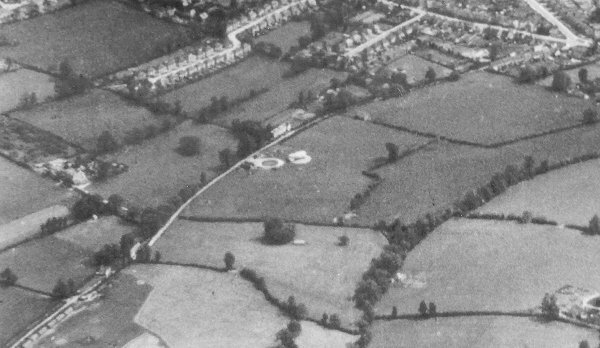 An aerial photograph of 1941 showing Larkhill Lane running from its junction with Preston Road at top right, down past Larkhill Farm at centre left. At centre, the circular object is Yeovil's Barrage Balloon Site No 19, "Larkhill Lane". 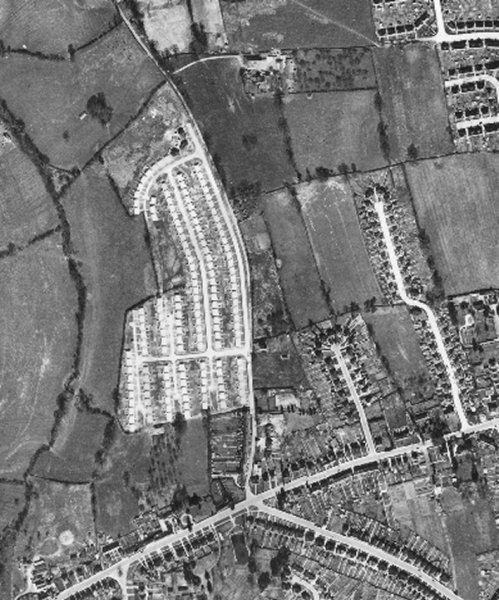 This 1946 aerial photograph clearly shows the development of the Larkhill Road 'prefabs' left of centre. Much of this section of Larkhill Road would be built in 1946 by Italian prisoners of war. Running across the bottom of the photograph is Preston Road and from the junction with Larkhill Road and running to the bottom right corner is Preston Grove. Larkhill Farm is at centre top. The fields shaded darker green are the fields that comprised Larkhill Farm in 1846 (owned by William George Prowse with James Pope as tenant) and the lighter green fields are those added to the farm by its sale in 1920. The field shaded yellow was the only field of Larkhill Farm to be sold in the largely unsuccessful sale of the farm in 1899. In 1846 fields 1 to 15 were owned by William George Prowse with James Pope as tenant, other field owners / occupiers at this time as noted below. in 1899 (see below) to Mr F Palmer. 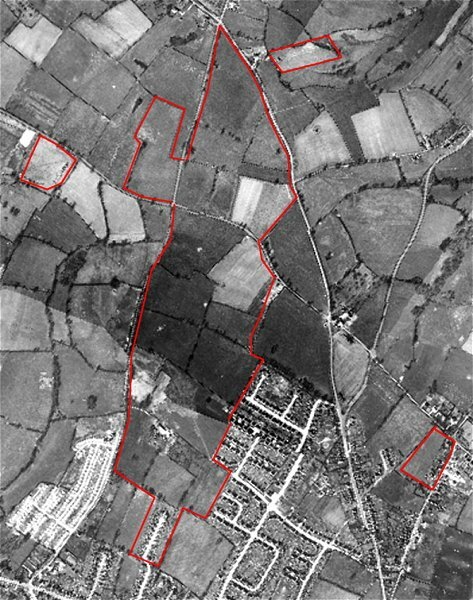 The outline of Larkhill Farm, as at the time of the 1920 sale, superimposed over the 1946 aerial photograph. The outline of Larkhill Farm, as at the time of the 1920 sale, superimposed over the modern aerial photograph. By the time of the 1931 sale of Larkhill Farm the size of the farm had been much reduced by over 100 acres, to just over 22 acres - Lots 20 and 21 shown here..
A notice following an attempted sale of Larkhill Farm from the 3 November 1899 edition of the Western Gazette. The parcel that sold was Dampier's Mead (Parcel 1350). 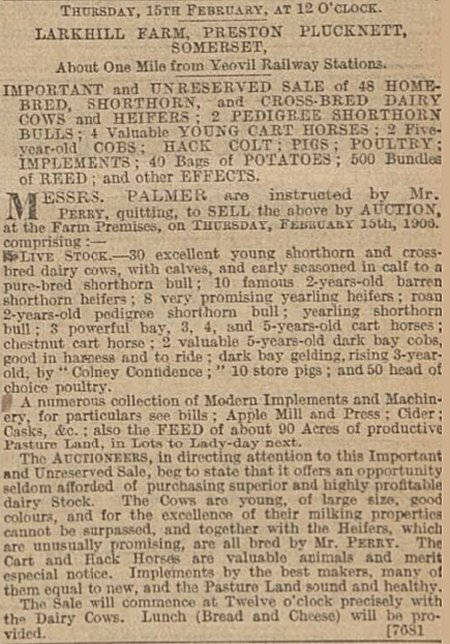 The notice of sale of livestock of Larkhill Farm in the 2 February 1906 edition of the Western Gazette. This sale followed the departure of Robert Arthur Perry in January 1906 and gives an excellent account of the livestock of the farm at this time. Notice of the sale of the Larkhill Farm dairy herd in the 24 September edition of the Western Gazette. 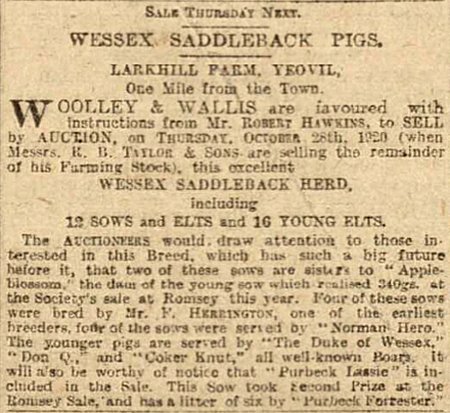 The notice of sale of the Larkhill Farm saddleback pigs - many of which had some notoriety - in the 22 October edition of the Western Gazette. Notice of the sale of the land of Larkhill Farm in the 3 December 1920 edition of the Western Gazette.